Free shipping. Buy direct from HP. 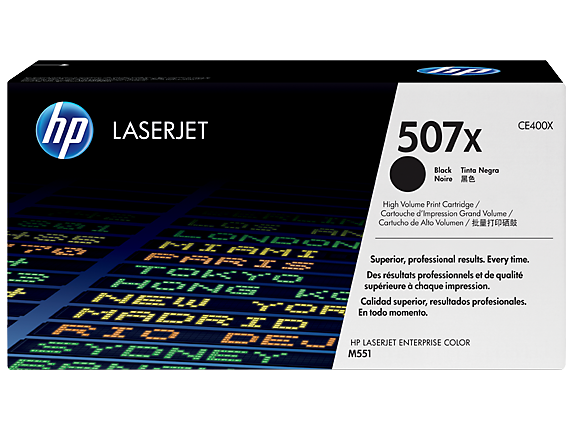 See customer reviews and comparisons for the HP 507X High Yield Black Original LaserJet Toner Cartridge, CE400X. Upgrades and savings on select products. Keep business productivity high. Avoid wasted time and supplies with a reliable, high-capacity Original HP LaserJet toner cartridge designed for frequent printing of emails, drafts, and documents with crisp, black text. Make a professional impression with sharp black text.Achieve consistent results on a wide range of papers designed for office printing.Count on consistent color—from page to page and cartridge to cartridge.Save time and money—print marketing materials in your own office. Count on consistent, uninterrupted printing with cartridges designed for your printer.Avoid frustrating reprints, wasted supplies, and delays. Get a better value for frequent printing.Look for the HP security seal to ensure you're buying an Original HP product.Confirm your cartridge is Original HP for performance and rewards, using HP Cartridge Authentication software. Change toner cartridges quickly and easily with automatic cartridge seal removal.HP helps you recycle your toner cartridges—it’s easy with the HP Planet Partners program.Plan ahead—use HP Web Jetadmin to track toner usage and receive regular supplies updates.Make supplies shopping easy with HP SureSupply. 1 Availability of rewards varies by country. For more information, see http://www.hp.com/go/learnaboutsupplies. 2 Program availability varies. HP print cartridge return and recycling is currently available in more than 50 countries and territories around the world through the HP Planet Partners program. For more information, or to request return envelopes and bulk collection boxes, visit http://www.hp.com/recycle. 3 Program features and availability may vary by country. For more information, visit http://www.hp.com/learn/suresupply. 4 Average color composite (C/M/Y) and black declared yields based on ISO/IEC 19798 and continuous printing. Actual yields vary considerably based on images printed and other factors. For details see http://www.hp.com/go/learnaboutsupplies. 5 Based on cartridge yields for HP 507A compared with HP 507X Original HP toner cartridges. For more information, see http://www.hp.com/go/learnaboutsupplies.